Thank You, to all our customers who wrote a review! We hope you will come back and write a review in the near future! Write a Review About Your Experience? It is Quick and Easy! Have a GOOGLE Account? Please Click Here! Jason was great to work with - very professional, honest and got the job done! Excellent communication, well thought out planning and trusted him 100%. 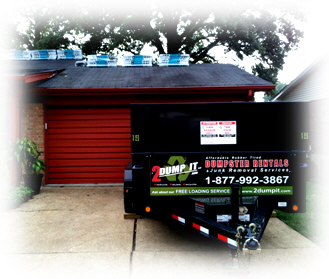 Thanks 2 DUMP IT for helping with our backyard cleanup and leveling! Thank You Laura! It was a pleasure working for you guys! I hope you enjoy your new backyard for years to come! - Jason W.
Our experience has been fantastic, prompt information and service, always friendly. Our delivery driver went out of his way to place the 40yd container where we needed it, he really went above and beyond what he was required to do in order to take care of us! Smooth painless experience. Would highly recommend. Jill was extremely helpful and courteous. Will continue to use 2 DUMP IT. Highly recommend. Delivered a rubber tired dumpster to my house while I was at work so it was ready for me as soon as I got home. Filled it up over the weekend and Monday after work it was gone. Made clearing out a huge amount of old deck boards a breeze. Friendly staff, great service. Needed some yard waste removed from the property, 2DumpIt provided the solution. Great price for the size container we were looking for. I would highly recommend. Easy, Prompt and professional. We had overpaid a little and getting our refund was painless. Definitely would recommend and use again if needed! We had the best experience with 2 Dump It. They were prompt and friendly. The dumpster was in the right place and easy to get to. The removal was even easier. Showed up early removed it and treated us very nice. I would recommend them to everyone we know. Thank you for making this project an easy one. Just recently used them for a dumpster rental for hauling yard debris. While I was in the middle of pulling out an old chain link fence with challenges due to a sloped yard, I learned they do excavating/grading work. Called the owner and he was out in less than 48 hours working magic. Both grading and pulling the posts that I couldn't easily pull out myself. They set my expectations well for the work and time estimate. When they went over on time, they gave a discount to help compensate without even asking. Did a lot of research before I hired them and was very impressed with both their pricing relative to others and their commitment to great customer service. Will definitely be using them again in the future. Erin at 2 DUMP IT is always fast to respond to our requests, and we have always been able to get the dumpsters within 24 hours. We appreciate their flexibility and willingness to work with us on short notice! Not to mention that they are much more affordable than our previous dumpster service. We had an excellent experience with 2 Dump It. They were easy to schedule, helped us with a dumpster that would fit under power lines. They did what they said they were going to do, did it when they said they would and were very nice people and at a reasonable price. I would not hesitate to call they again. Jason did a fantastic job excavating the old material from our flower beds, hauling it away, and spreading the new garden soil for us. He was very friendly. He went above and beyond to make sure we were satisfied with his work. We were absolutely thrilled with the job he did. He sure saved us a lot of work and aching muscles! Jason Wilson provided excellent work when demolishing a small "mother in law" house nestled amoung trees on the back corner of my lot. Cost incurred were very fair. When some demo issues occurred he trouble shooted the situation and provided quick solutions to complete the project. I highly recommend 2 Dump It. Great work and service at a very fair cost. Phone representative was very helpful and polite. 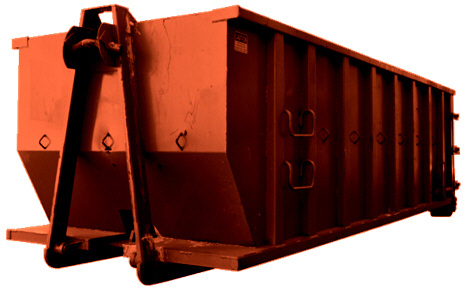 The option of a rubber wheeled dumpster fit our needs perfectly. The dumpster was available to us at no extra cost a day early than requested. The driver gave me a call to let me know of their arrival and came into our business to get specific drop off location. The driver was also very helpful and polite. The dumpster was picked up as promised. Price is also very reasonable. Would definitely recommend to a friend. Excellent, hassle-free service. I needed to get rid of an old deck and furniture. Dumpster was waiting for me after work and picked up after the weekend, about as effortless as it gets. Will definitely call them again in the future. Working with Jason at 2Dumpit was a a pleasure. Jason is quick to respond even on the weekends! 2Dumpit provides a clean and professional setup with their awesome RTD's. Shane was our driver and he was both early and on time with his delivery and pickup. The drivers will also call ahead of time before they pickup your dumpsters as well. Their staff who answers the phones are also very friendly and very willing to help you get the product you need when you need it. This is certainly an A+ company you can trust with your dumpster needs! Awesome experience! Delivered when promised, picked up when promised. Used twice during our demo, and will use again for our construction phase. Called and had a 30 yard dumpster delivered, it was convenient and easy. Driver and Jill in the office provided nice service. Would use again. Excellent Service. Cheapest price around. I will use them again. I have used 2 DUMP IT in the past, and I needed another dumpster (and OF COURSE I would use them, because of their very reasonable pricing and great service). I mentioned that I was in need of yard grading for this particular project, and they were able to help me out once again. The property was graded (for a reasonable price), and it looked awesome! Friendly and helpful owners and employees. Do yourself a favor and look no further...This is the company to choose! If you choose a company other than 2 DUMP IT...You have made a big mistake! This company has better service than I thought imaginable! They go over and above the call of duty. I had previously written a great review, but then I had to order more dumpsters, and...wait for it...their service was even more fantastic! Personable and helpful office staff, and outstanding site employees! Very reasonably priced too. I wish I could give them more than 5 stars! I am on my 4th 30-yard dumpster rental, and I am 4 times happy! One of their great employees, Eryn, is always polite, cheery, and helpful. All my questions and concerns are readily answered and resolved. The company has quick delivery and pick-up. I also believe them to be competitively priced. I highly recommend this company! Very satisfied with the service. Have used this company twice and both experiences have been great. Had the owner Jason arrive with the dumpster that I ordered yesterday. He offered to help me load the decking and other materials that I was disposing, at no extra charge. Unbelievable service, would recommend them to anyone. I use 2 DUMP IT for all my house flips. These guys deliver the dumpster on schedule and remove it promptly. The dumpsters are on wheels so there's no damage to the drives. Sometimes it's hard to reach them but they always call back when you leave a message. Thanks for the Review Calvin! We appreciate your business! If we don't answer its because we are helping other customers or it is after hours or weekends. As you stated, we will return your call if you leave a message! They were exactly as advertised: on time and quick pickup. Shane was friendly, funny and helpful. Definitely would reccomend. 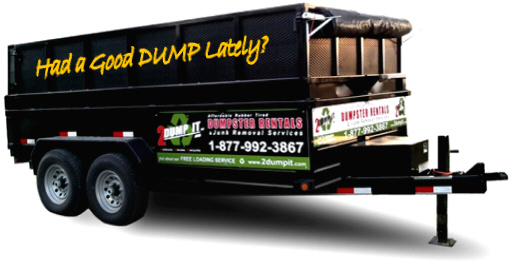 2 DUMP IT is definitely the right choice for dumpster rental! I have used (so far) 3 of their large dumpsters and their service is wonderful. You can't beat their friendly and helpful staff either!! I highly recommend them, and I will use them again in the future if needed. They are also very competitively priced. I have used your services multiple times for projects at our house of the years and keep coming back to you because you are highly professional, very responsive, and quick to get dumpster to our house. Thank you!! !